I've got to be realistic! I've got too many projects on the go (13E1 SE-OTL and MoFo amps for example) and finite funds and if I'm honest Its very unlikely I'll ever get back to the 6C33C SE-OTL project so I'm wondering if anyone might be interested in taking various parts off my hands so they too can sample the delights of these magical amplifiers. AT poster Wolfgang has built this project and rates it very highly and better than his Transcendent 300B SE-OTLs. 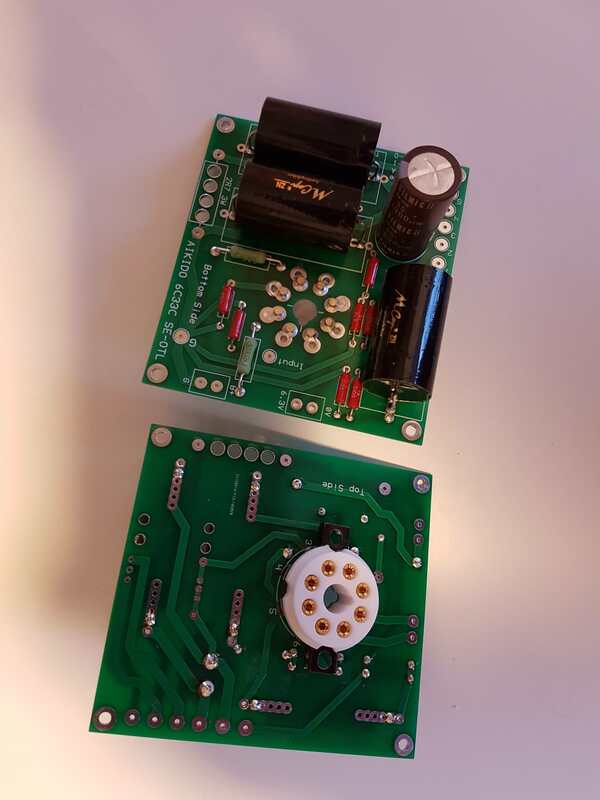 2 * assembled 6SN7 driver stage PCBs, as per the schematic in the thread (picture below). 2 * 'silent' cooling fans (with a small but good quality encapsulated SMPS module to power them). If of interest I can include a pair of the PCBs (unpopulated) I used for the 6C33C B+ supplies featured in the thread. Apart from hooking it all together, you'll need to come up with a suitable chassis and a B+ power supply for the 6SN7s (I was going to use a Neurochrome Maida regulator but I'm repurposing it) . Here's a picture of the driver boards. Warning: the high current of the 6C33C filaments mean they run hot so any chassis will need to manage the heat - I was planning on using some low voltage 'silent' fans, hence the mention of them above. Also, high efficiency speakers are essential (and even better would be 15/16 ohm impedance) with this sort of low powered amp - don't expect it to drive the likes of LS35As. I'll be happy to take £250ono plus shipping at cost and PayPal fees.